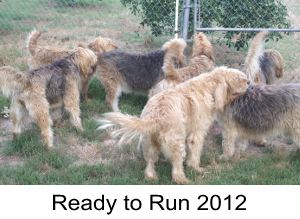 Here are a few of the questions we are often asked about Otterhounds. 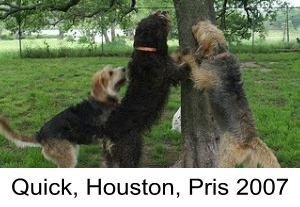 You can find the answers to these and more on the Otterhound Club web site http://www.otterhound.org/. I will answer them based on our personal experience. Do they get along with children? Do they get along with other dogs? Do they require a lot of exercise? 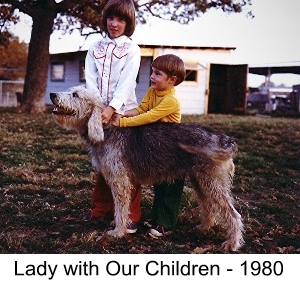 Do Otterhounds get along with children? 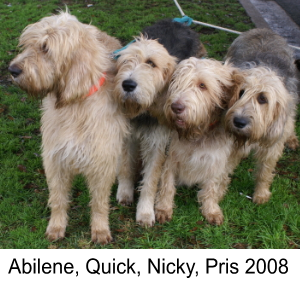 All dogs are different even within a breed but we have found Otterhounds friendly and easy to get along with. Both of our children learned to stand and walk hanging on to an Otterhound. Do Otterhounds shed a lot? All dogs shed but the Otterhounds don’t shed as much as some of our shorter haired dogs. There is more shedding in the Spring and Fall with the changing seasons but the double coat tends to cling to its self. Regular grooming eliminates both shedding and matting. 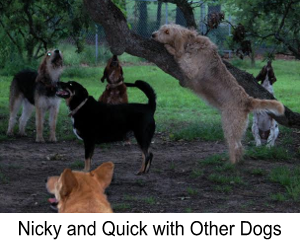 Do Otterhounds get along with other dogs? A lot depends on their upbringing and exposure during their early weeks. We have a mixed lot of dogs at our place and they get along most of the time. When a new dog comes along we carefully introduce it to the pack and then take them for a run. Generally by the time we get back the new dog is one of the pack. Do Otterhounds get along with cats? Again a lot depends on their upbringing and exposure during their early weeks. Nicky, Pris and Quick were all introduced to our daughter’s cat at an early age and they tend to ignore him when they are in the same room. Now that she has two cats they accept them both with out a problem but they do like to bark at our barn cat. They are a fairly high energy dog when young. During their formative years – birth to two years – they need a good bit of exercise to insure proper development. They are bred to hunt and if given a large fenced area they will see to their own exercise. As hunters they will take off on a scent so it is not advisable to let them loose in an open area. As they mature they require less exercise and can be perfectly happy with a brisk walk a couple of time a day. Just be sure to keep an eye on their weight. The general information is ten to thirteen. 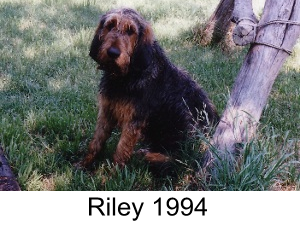 We have had an Otterhound live to fourteen but most live ten or eleven years. All breeds have some health problems. The one you are most likely to encounter is ear problems. The large pendant ears tend to get infections if not properly taken care of. As with most large breeds hip dysplasia is a problem. There are so few Otterhounds it is hard to breed for good hips. I have had Otterhounds with good hips and bad. 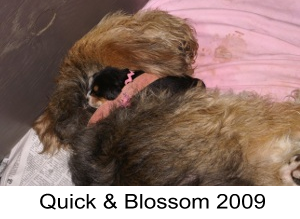 We had a female with severe hip dysplasia and her sister had good hips. The one with severe hip dysplasia lived ten years and this was in the ’80s. Now a lot can be done to help a dog with hip dysplasia. There is a blood disorder that crops up in Otterhounds that can result in severe bleeding. However, all our Otterhounds have been tested and are clear on that count. Just as with people there are numerous problems that can occur but by and large Otterhounds have few problems.